A newspaper group has published a 32-page supplement commemorating a county’s role in the First World War. 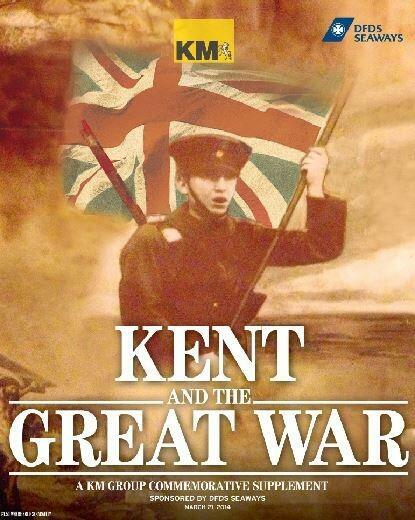 The KM Group pullout marking this year’s centenary of the outbreak of the war highlights Kent’s role in the conflict and has been published across all its titles. It is one of two supplements planned by the family-owned group to mark the 100th anniverary. The publisher has also completed digitising its newspapers from the 1914-1918 period, which are now available to read online. The supplement, produced by former managing editor Lesley Bellew and award-winning designer Ashley Austen, was sponsored by DFDS Seaways. It covers a series of topics including the leading role played by the Dover Patrol, which saw hundreds of fishermen manning trawlers and drifters. The digitising of the wartime newspapers continues a project which began when the KM Group scanned pages from the 1852-1912 editions of the South Eastern Gazette, which was the forerunner to the Kent Messenger. Nice looking supplement. My only criticism is that I’d have put the two logos one on top of the other on the right, rather than the KM centred, which distracts slightly from the image. The Daily Telegraph has produced some very interesting WW1 supplements, but to have one that deals with local stories will be more interesting for readers. Well done. should go down well. Nostalgia pieces are one of local newspapers’ few selling points these days. It’s not a German cap.